The Truth About the "Horrors of Andersonville"
Very much has been written and much more embodied in the partial reports and ex parte investigations of the so-called "Horrors of Andersonville" and the "inhuman treatment" of the prisoners of the Federal armies by the prison officials, and the agents of the Confederate States War Department. These publications have emanated from the press of Northern publishers and have been inspired by a spirit of enmity which is evidently partisan and extremely vindictive. Doubtless, much that has been thus detailed of the privations and sufferings of the prisoners captured by our Confederate armies and sent for security to prison camps, is true. From the very nature of the imprisonment, prison life, at best, is one of privation. "War is hell on earth," said General Sherman when attempting to justify the enormity of acts perpetrated by his troops on the defenseless women and children of Georgia during his march to the sea. If there by any doubt of the truth of Sherman's declaration, he certainly made the proof of it conclusive as he rode at the head of an army that brought the terrors of Hell to the defenseless people of Georgia and the Carolinas, when his legions went plundering, murdering, and like savages, pillaging and then burning the homes of unresisting non-combatants. The rules and usages of civilized warfare require that all non-combatants should be immune from capture and that their rights of property should be respected and furthermore, that combatants should be held when captured as prisoners until properly exchanged; and, while under restraint as prisoners, that they should receive the same rations of food as were issued soldiers of the line, being treated, not as criminals, but as soldiers worthy of the respect and consideration of a chivalrous enemy. Such was the uniform practice in the early period of our Civil War, especially with the regularly organized opposing armies, and so it continued to be with these armies until the end of the war. It was only with these irregular bands of "Bush Wackers," Guerrillas, and Rangers that prisoners, captured in battle, were badly treated. At an early date in the war a cartel of exchange of prisoners captured in battle was agreed upon between the Federal and Confederate governments. Under this cartel there was no unnecessary delay in the exchange, but as the war progressed the cartel was modified, suspended or dis-regarded by the Federal war office to suit the expediency of a brutal war minister, Mr. Stanton, who, to secure the triumph of the partisan cause, violated every law of civilized warfare and with the zeal of a fanatic, inaugurated a savage rule of extermination. 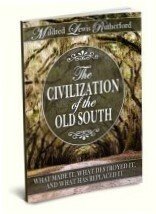 It was discovered by the savage exponent of the radical war party at the North, that as soon as a Confederate soldier was exchanged for one of their hirelings, the Confederate at once took his place in the ranks of the patriot army, willing and ready to devote his life in the defence of the cause he believed to be just, and of a people he knew to be shamefully outraged. On the contrary, the hireling, the pauper recruit, from some one of the European States, would in the majority of instances, under some subterfuge, sneak to the rear and wait the contingency of a pension for meritorious service. At once the zealous Secretary of War found some pretext for suspending the cartel of exchange of prisoners, and for inaugurating a system of slow and certain death at the Federal prisons that will make the history of Camp Chase, Johnson's Island, Fort Delaware, and other prison pens in the frozen North, a monumental record of Stanton's brutality and the mean, vindictive spirit of his partisans. There was, and there yet remains, an undeniable excuse for the Confederate treatment of the prisoners confined at Libby, Belle Isle and elsewhere. Their want of abundant food so much complained of, came from the same cause that made the empty haversacks of our own soldiers in the field. Compare these rations issued to the Confederate army with the rations regularly issued to the prisoners at Andersonville, and who among the half-starved patriots of the Confederate army would not have gladly exchanged with them. Finding it impossible to defeat the Confederate army in an open, manly contest on the battlefield, even with the odds of three and four to one, the plan of starving these invincible battalions was resorted to, even though in starving them they were rendering it impossible to furnish their own prisoners with a soldier's rations. An order issued to make desolate the Valley of Virginia (how cowardly! ), Sheridan, with his torch in one hand and their savage order near his brutal heart, moves an army of marauders over this fertile region, the granary of the South. His terrible mission ended, with remorseless exultation he informs his master, "I have made the valley so desolate that a crow to live will have to carry army rations on his back as he flies over these hills and valleys." He might have added: "And I have left in the bleak winds of winter more than one thousand women and children without a sheltering home or a crumb of bread." While Sheridan was thus trying to starve the army of General Lee, he was destroying the food that would have gone in part to the prisoners at Andersonville. It is safe to say that the thousands of cattle and hogs and the countless bushels of wheat, corn and potatoes burned and wasted by Sherman's army on its barbarous march through Georgia, would have fed the Andersonville prisoners for months. At Oconee, on the Central Railway of Georgia, Howard's corps burned two trains of cars loaded with corn meal, flour and bacon, on the way to feed the Andersonville prisoners. When informed by the conductor of the train of this fact, he was answered by Howard's commissary that he did not believe him and ordered the conductor under guard as a prisoner and forthwith set fire to his cars. When asked why he did not take the flour and bacon for the use of his army, he answered, "We have more now than we can haul; our men have been feeding on chickens, turkeys, milk and honey ever since we left Atlanta." Again when prisoners had accumulated in such large numbers at our prisons to render it impossible to furnish them with other than the plainest food; when, owing to the blockade of our ports, and from the further fact that quinine and other medicines had been declared "contraband of war" by the Federal authorities, every possible effort was made by the Confederate Secretary of War to secure a general exchange of prisoners. A frank statement of the conditions which rendered it impossible to give to the prisoners other than the service they were receiving, was made as an appeal for humanity's sake; made to secure their release by resuming the cartel for a general exchange of all the prisoners held on both sides. This was refused. Had this exchange been made it would have added several thousand good recruits to the Confederate armies and, man for man, would have still left a large surplus of Federal prisoners in the Confederate camps of detention. Our Confederate Secretary of War, through his commissioner, Col. Ould, then offered to receive quinine and other much-needed medicine and any commissary supplies that might be sent to the Federal prisoners for their exclusive use. This offer was also refused by the Federal Secretary of War. Thus it is a matter of historical fact that the real cause of any suffering among the prisoners held either at Andersonville or elsewhere in the South, was the refusal of the Federal Government to carry out in good faith the humane and equitable cartel of exchange agreed upon in the early period of the war, and to recognize and conform to the usages of war between civilized and enlightened nations. As to the climate and its effect upon the constitutions of the unacclimated persons, the Confederate government was in no wise responsible. Our Secretary of War was not the Lord of the winds nor the Prince of the air. He could not rule the rays of the sun or the dews of the night. All he could do, and that was done, was to select the healthiest places in the South, where the prisoners could be held secure and provide them with such rations and comforts as were issued to our soldiers in the field. How was it with our prisoners in the pens and camps in the bleak regions of the North? There could be no possible excuse for starving them, since they were in a land of abundance. No armies had desolated their teeming grain fields; no torches had burned their mills or destroyed their immense store-houses of food. The poor prisoner could look wistfully out from his cheerless pen upon all of this teeming abundance only to suffer the pangs of "Tantalus" while slowing starving to death. There was food almost in his grasp. From the standpoint of a private soldier in the Confederate army the author presents a truthful account of his capture, imprisonment, and sufferings in a Federal prison. Hundreds, who like himself, endured these pangs will find in these pages experiences that they have realized and from which, like him, they have only escaped with life, through the intervention of a divine providence. Let those who still harp on the "cruelties of Andersonville," read the other side of this wretched story and then, if they are honest, the wonder will be that they have not sooner discovered the "beam" in their own eyes. This article was extracted from John H. King, Three Hundred Days in a Yankee Prison (Kennesaw, Georgia: Continental Book Company,  1959). Click HERE to purchase this title.